The Select City Walk, Saket is loaded with food options galore. You think of a variety in cuisine and a warm ambiance, this place has it all. Besides the food court, there are specialty fine dining restaurants that cater to a large number of foodies. Enter Andreas Eatery that has an amazing array of lip smacking delicacies to please the palette. I visited the place last week with my daughter. Located on the first floor of the Select City Walk, Andreas Eatery spells opulence beyond compare. The warm and hospitable staff is the first thing one tends to notice. The restaurant manager welcomed us and escorted us to our reserved table. The restaurant is articulately designed to display a cozy vibe. There are chairs and tables inside and outside the eatery. One can enjoy a nice view of the mall while dining or sit indoors for a nice cozy meal with friends and families. Although the menu is exhaustive with dishes ranging from entres, soups, salads and main course, we finalized on the scrumptious Chicken Ala Keiv dish. The chicken breast is a hearty dish that had a profuse use of herbs delighting the taste buds. Accompanied with mashed potatoes, buttered sauté beans is an extremely scrumptious dish that should not be missed. The sea bass fennel we ordered next comprised of fennel mashed potatoes, wilted vegetables, herb salad and fennel cream sauce. This dish is definitely a good spin on the conventional sea food that was succulent to eat. It was a brilliant combination of flavors and sauces that composed a medley in the first bite. We also enjoyed a chilled glass of Lemon drink with a tangy intonation spiked with fresh orange and mint. We also ordered the Fresh Butter garlic prawns. 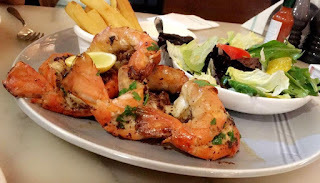 The Anjuna style pan eared prawns served with hand cut fries was the highlight of the review that stole my heart. The prawns showcased innovative flavors and textures, inviting me to finish it to the last bite. We had ordered the Terriyaki noodles in chicken but preferred to get the it packed to go. This one satiated us to a level impossible to express. The ingredients of the dish mix well with chicken. The review was one of the most memorable one. It is definitely a place to explore if you love experimenting with food.